What is Rockbrook Camp’s mission? Our mission is to provide a haven for girls, a place of their own, where they can explore the beauty of nature, try new things, enjoy carefree summer living, and make some of their very best friends. What are the Rockbrook facilities like? Rockbrook is situated on 219 private acres in the Blue Ridge Mountains. Most of the buildings are original to the sleepaway camp. So, campers live in rustic wooden cabins with bunk beds. Each cabin is just a short walk away from a stone lodge for age group meetings and a bath house with private showers and toilets. Activities happen in many cabin-like buildings throughout camp. Our mountain spring-fed lake also houses our swimming and paddling activities. 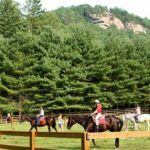 The camp riding center includes 2 barns, a large covered arena, outdoor jump course, beginner ring — all situated on the flatter part of camp where 30 horses live every summer. Rockbrook is accredited by the American Camp Association, a distinction marked by adhering to almost 300 industry-accepted standards deemed “best practices” for summer camps. There’s more about the ACA on the accreditation page of our site. Our campers have finished kindergarten through the tenth grade, and are usually between 6 and 16 years old. They live in cabins according to grade, assuring cabin mates will be approximately the same age. For activity periods and special evening programs, we divide into three age groups: Juniors (K-4th grade), Middlers (5th & 6th grade), and Seniors (7th, 8th and 9th grade). What happens if a camper gets sick or needs regular medication? At least one registered nurse staffs the camp health hut at all times. Campers receive regular medications there and nurses provide general health care. A physician’s assistant is on call for us throughout the summer. We have regular office hours at our local pediatrics practice, and every camp staff member is certified in CPR and first aid. Here’s more about Rockbrook’s camp health care. We serve tasty, balanced meals in our dining hall where campers eat “family style” with their cabin-mates. In addition to the hot meal at lunch and dinner, we always have a salad bar, vegetarian option, and a peanut butter and jelly station. Throughout the day, we have fruit and snacks available to keep us going. Here’s more about Rockbrook’s camp food. What do the camp fees cover? The session fees are all-inclusive. 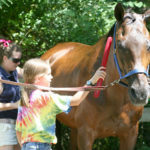 They cover living expenses, activities (including horseback riding, ceramics, and adventure trips), activity instruction and equipment, in-house health care, and weekly laundry service. Campers can spend a small amount of money on non-food, incidental items at the camp store. Our staff members come from all over the country and sometimes from abroad. Many of them are former Rockbrook Campers. Each goes through a very rigorous interview process and background check. We want to make sure we have the best female role models working with our campers. We have found that it is best for campers not to talk with family and friends from home as it actually encourages homesickness. Therefore, campers may not use phones while at camp. Regular mail is the best form of communication, and most find it to fit in perfectly at camp. Campers may also receive, but not send, emails through our one-way email system. These emails will be put out with regular mail after lunch each day. Are visitors allowed to visit campers during their session? Campers are not allowed to have visitors while at camp. It too easily disrupts their adjustment to camp life and typically encourages homesickness. Will someone contact me if my camper is having difficulty adjusting to camp? Yes! One of our directors will contact parents if their camper is experiencing significant homesickness or other issues a parent may need to know about. Parents are always welcome to contact our office as well. Yes. Please call the camp office to schedule your tour and get directions to the camp office. If you can, it is best to come during the summer to see camp in action. 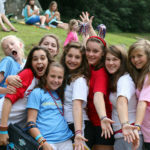 How do you know if you are ready for sleepaway camp? It’s very important to remember that every child is different and that a little bit of nervousness about a first overnight camp experience is completely normal. We offer various lengths of time to accommodate the needs of girls ages 6-16. Be assured that our staff members are trained to work with girls of all ages to make their adjustment to being away from home much easier. Being excited about camp is the right first step. It’s also great to practice before going away from home. For example, spending the night out and learning to shower on your own are great things to do in preparation for camp. Here are other great tips. Does Rockbrook have any religious affiliation? How many campers live in one cabin? A typical cabin group has 8 campers and 2 counselors. Does camp provide transportation to Rockbrook? It is each camper’s family’s responsibility to get her to and from Rockbrook. The only exception is flying. If a camper chooses to fly to camp, Rockbrook provides transportation to and from the Asheville Regional Airport (AVL). All flight arrangements should be made ahead of time with the office. Laundry is done once a week at our sleepaway camp. So we suggest bringing clothing for about 10 days to accommodate for a 2 day turn-around. The commercial laundry can be tough on clothes, so we recommend that campers leave their nicer items at home. Can I request to have my friends from home in my cabin? Campers may make one mutual request for someone who is in their same grade and attending the same session. We work hard to make sure as many requests as possible are granted. However, final cabin assignments are at the discretion of the directors. You will be notified if our request cannot be granted prior to your camp arrival. After February 1st there are no tuition refunds. Prior to February 1st, any cancellations receive a full refund. Can campers receive packages at camp? Rockbrook has a no package policy to encourage its non-competitive environment. Please be advised that any packages sent to camp will be returned to sender or held until closing day. So why is camp so important for girls? There are so many reasons! Spending time at a sleepaway camp has been shown to have profound and lasting benefits for children. 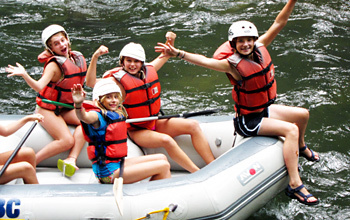 Read our Top 10 Reasons Why Camp is Great for Kids.